The HP TouchPad may not be the most technically advanced tablet out there, but it seems that webOS wasn’t able to take advantage of the hardware that was there. We do know that webOS wasn’t fully graphically-accelerated, not taking advantage of the Adreno 220 graphics chip as well as in could. But what else lurks within the TouchPad? How about USB host support? RootzWiki member green discovered something interesting: the TouchPad actually has USB host support, albeit limited. 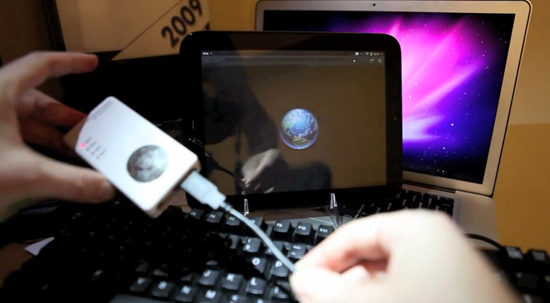 He was able to hook up a USB keyboard to the TouchPad and start typing. Format an SD card on $1, wiping anything that might have been there. Call this when some random card is installed, Next time you boot the card will be mounted and have a cryptofs container created and mounted so it participates fully in WebOS. This isn’t ready for use yet. We don’t yet have any way to ask users what they want to do when we can’t mount a card, and certainly can’t willy-nilly nuke whatever they had on it without asking. Huhwha? There’s a whole file in webOS dedicated to how the OS will eventually support SD cards? Yep, it certainly appears that way. This makes sense in conjunction with the USB host support, and we’ve been seeing webOS fans clamoring for external card support since January 2009 when the original Pre was announced. As the file notes discussed, it’s not quite ready for public implementation, but the support was/is being worked on for future card slot-sporting webOS hardware. You know, if that ever happens. Update: Sam confirmed for us an interesting tidbit about the SD card file: it was taken from the webOS 2.2 doctor!